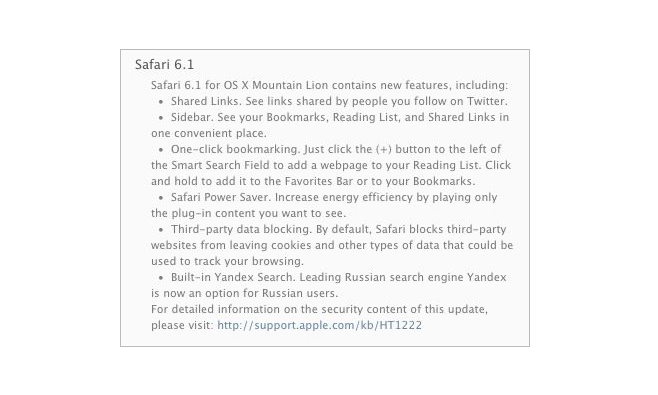 Mac owners who will not be taking advantage of the free upgrade to Mavericks can nonetheless enjoy some of updates Apple has made to their Safari web browser. Safari 6.1 for OS X Moutain Lion brings some of the browing features touted for Mavericks to Apple's previous generation operating system. The sidebar, with its new Twitter Shared Links function and consolidated Bookmarks and Reading list interfaces, comes over alongside the new "Add to" menu on the left side of Safari's address bar. Safari Power Saver also trickles down to Mountain Lion. Power Saver helps increase battery life by only directing processing resources to content that is in the foreground. Flash animations on hidden tabs, for example, would not be actively processed until their tab is selected. Safari 6.1 is available as an update from the Mac App Store now.